back in Day 1 we weren't doing as much of it. Nowadays everyone considers themselves to be the head cave painter I haven't seen cairns where I am anyway, the fashion probably hasn't reached my area. Would be against pink tape certainly. Those pink tape afixers should have their hands removed via blunt hatchet the minute they return to the carpark. I can handle the odd, discrete rock cairne...even better if you actually have to work a bit to find them. There is some sense of satisfaction in that somehow. Being a solo walker it can be a relieving moment to stumble across a small, seemigly insignificant cairne when in one of those "sticky" situations. puredingo wrote: I can handle the odd, discrete rock cairn...even better if you actually have to work a bit to find them. There is some sense of satisfaction in that somehow. Being a solo walker it can be a relieving moment to stumble across a small, seemingly insignificant cairn when in one of those "sticky" situations. Until it turns out it's the only cairn within a 100 square mile area . . . I always treat solo cairns with suspicion. I've found too many that are remnants of attempted routes that turned out to be unviable due to minor issues like 20m cliff lines or impenetrable scrub. Last edited by north-north-west on Fri 26 Oct, 2018 3:20 pm, edited 1 time in total. "A Parks Vic employee [Coopracambra NP] told me that plastic tape was used to mark locations where bait (foxes, dogs) had been laid. In some situations, it needed to be visible on the side of a track by other staff when driving. Perhaps someone can confirm or deny whether this is routine. All I will say is that if such baiting gets results, I'm happy to put up with seeing the tape." No confirmations or denials were posted. So I am asking again. Two further points. That exchange with Parks Vic staff occurred at least a decade ago. Maybe it's a discontinued practise. However, I saw two dangly bits (of pink tape, that is) in Cobboboonee NP (GSWW) last week, spaced less than fifty metres apart on the side of a vehicular track that had tyre marks. I very much doubt that this tape had a navigational, decorational or cosmological purpose. north-north-west wrote: [ So don't try to guilt me, through an implied perception of hypocrisy, into accepting any and every impost upon our natural world that some ignorant entitled twit doesn't care about, because it doesn't work. Oh, the Hypocrisy is there, it is entirely up to you what you do with it. 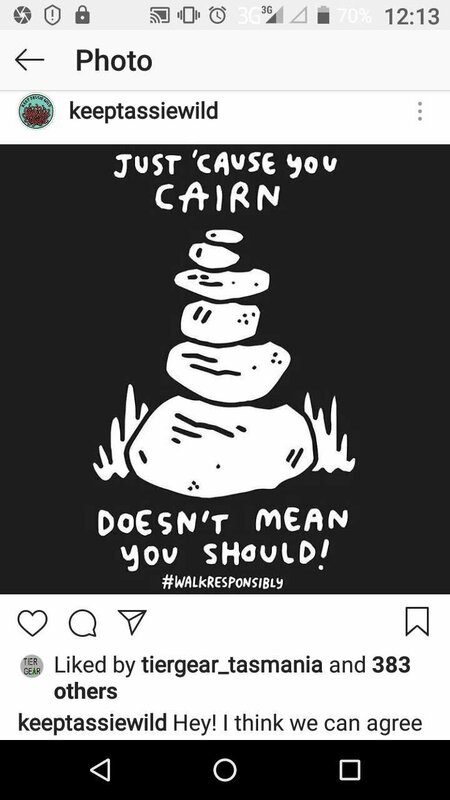 No , you don't have to accept " every impost upon our natural world that some ignorant entitled twit doesn't care about", just don't get bent out of shape over cairn builders when your actions result in similar consequences. No, I don't build cairns. Some use pink tape for research purposes. Would be nice if the Parks provided some logo tape so the rest of us, can identify that from the rubbish others are using. When I find them on established tracks where the route is obvious (even for novice walkers) I generally kick them over. crollsurf wrote: Some use pink tape for research purposes. Would be nice if the Parks provided some logo tape so the rest of us, can identify that from the rubbish others are using. That's an excellent idea. There would need to be economies of scale to make it viable. One way may be to have one pattern for all parks and for all parks agencies to place orders at the same time. I'm aware of state and federal agencies doing this for an item that was very similar for both. It would need to be restricted to the public. Otherwise I'm sure the people that currently use pink tape now and play pretend ranger would try to get their hands on it too if only a pattern. My intent was that only park agencies could have the tape. While some people may remove this tape and use it for their own purposes, they would be a minority, especially in places more distant from open roads. Given the point I already made about how our modern society has so much impact on the environment, if objecting to unnecessary, self-indulgent damage whilst doing everything Ii can to minimise my own impact is hypocritical, the only way to not be a hypocrite would be to top myself. Is that what you are suggesting? If I don't have to accept this sort of damage, why are you getting all bent out of shape over my objections? Can you at least try to be logical? Just keep them to a minimum...anything more than that is wilderness graffiti. Whilst I am quite firmly in the "No Cairns" camp, do people feel the same way about the various snow pole lines over the Bogong High Plains? Is it same/same or same/different? There's a difference between navigational aids and pseudo-artistic wankery. The pole lines are a navigational aid that was perhaps more important in the pre-gps days of paper map and compass and nature is slowly taking action. They also have a heritage value although I may be resistant to replacing poles that have fallen. If one argues that the poles should disappear then, on that basis, all huts should go along with things like the chain across Big River. Off topic but I don't mind if huts go. They are remnants of a period where areas that are now national parks were severely abused. Just like feral horses, huts shouldn't be romanticised. On topic... I'm in the "No Cairns" camp. Learn to navigate. north-north-west wrote: the only way to not be a hypocrite would be to top myself. Is that what you are suggesting? I saw my first cairn today, on the start of the Goldsborough track, only a few hundred metres from a popular public swimming hole admiittedly. I said to the person I was with, that's a cairn. They said they hadn't heard of them, which I found mildly comforting. Not just something noticed here, and as I'd kind of supposed - often connected to the narcissistic, self-promoting culture of social media. I figure that people have been making marks on the Earth for thousands of years, and those marks will have always been a reflection of cultural mores of the time. I guess that's what we're seeing here, and while they practically have little impact environmentally, they do perhaps signal a change in attitudes to nature? There is still some kind of respect there - some awe of the natural world, but which has been pushed aside to make room for the air of self-importance that seems to be a thing now. On the AAWT from Walhalla to Mt Hotham in fog and rain and with few and no markers, tape and cairns saved time and energy. I do not tape or make cairns, or do I remove them. Get angry over feral horses in National Parks,climate change or some thing important. Two more cairns at the local swimming hole which is a major tourist attraction. The guy a foreigner and his adult daughter in a rock pool assembled them a hundred yards or so from everyone swimming. They were showing off a bit like like kids, glancing back towards everyone hoping they would be noticed doing it. Really silly to re-arrange landscape like this, not to mention its a signed habitat for various water species. In about 15 minutes I became part of the hate cairns camp. They're everywhere in the UK. I never touch them over there as I don't know if they are 2 days old, or 4000 years old. However, in Tasmania, cairns are only an aesthetic issue: they don't damage the environment, have no historical value, and tend to only upset people who don't like that human sense or order being imposed on a wild and chaotic environment: if they gravely offend you you can push them over and scatter them, no harm done. I wonder though if cairns on lower ground (if there are any) have been put there as markers for food drops or navigation aids though. Cairns, in Tasmania and elsewhere in Australia, can have historical value. Example: the cairns marking Ritters Track on the Central Plateau. Just before the start of the Fluted Cape Track on Bruny is a beach that sets all other 'cairned' environments to shame if you know it. It must be the ancestral home of all the world's cairners and rock stackers. even trees have rocks balanced on their limbs! Yeah, it's revolting. That's exactly the sort of thing that gives cairns a bad name. A modest summit cairn, a few strategically placed rocks for navigational purposes, even the big old Sprent cairns on some peaks, fine. But that sort of rock stacking is just self-indulgent wankery. Here is a rather poor shot of cairns gone crazy - not all are in frame. Stone cairns and markers have a definite purpose. That is, to help the erector, or his/her followers find their way. When their use has ended they should be knocked down. Unless they have been erected at great expense by a government surveyor (wanker?) and his/her staff. I will use sticks or something to remind me of a route rather than stones. I won't disturb existing cairns or stick markers unless they need to be made more obvious. I prefer not to leave a trace.This way, in my wanderings, it may not matter much if I don't return. These days however we have digital cameras which have reduced the need for lots of markers. Traveling in a group increases the number of eyes for route finding. If you have friends, take them along. I have never erected a cairn (although I may have added a small stone to an existing summit cairn once or twice). Sometimes cairns serve a ecological purpose particularly in delicate environments. By directing walkers to the route across a particular area it can help avoid multiple routes or attempted routes and consequential degredation of the whole area.